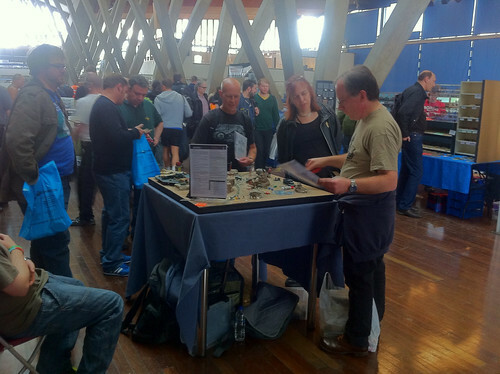 This Sunday I took the Gruntz 15mm game to one of the best sci-fi, historical and fantasy Wargames conventions in the South East. 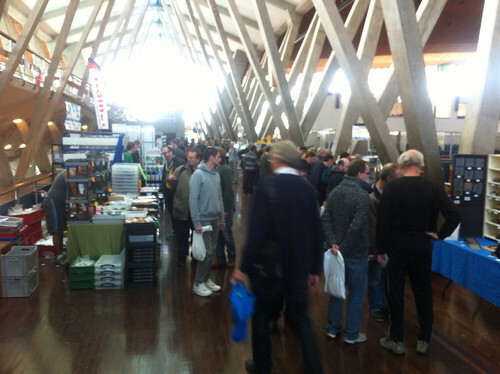 Running since 1971 (when I was born), it is a relaxed show, with easy access in South London and worth making the effort to attend with some great traders and games. 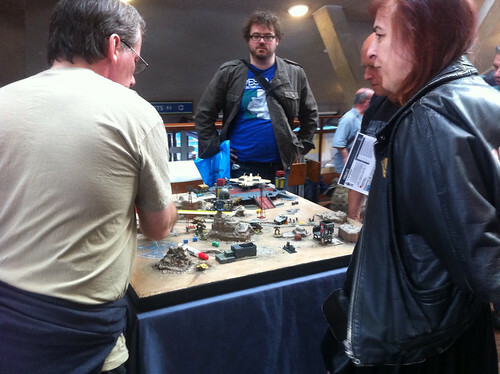 I have been attending since the early 90's and still get that same Wargames show buzz on every visit. 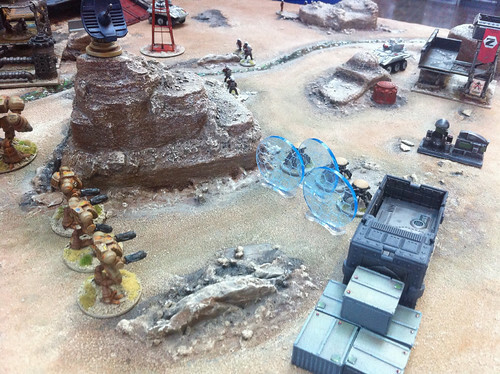 The Gruntz 15mm games played well and we managed three sessions which took between 45mins and 1hr 20. This depended on the players and how rapidly the players were pushing for the objective and the general chat during game. Jon from GZG gave us some excellent 15mm prize packs for the winning player of every game and some troop packs for players that took part. 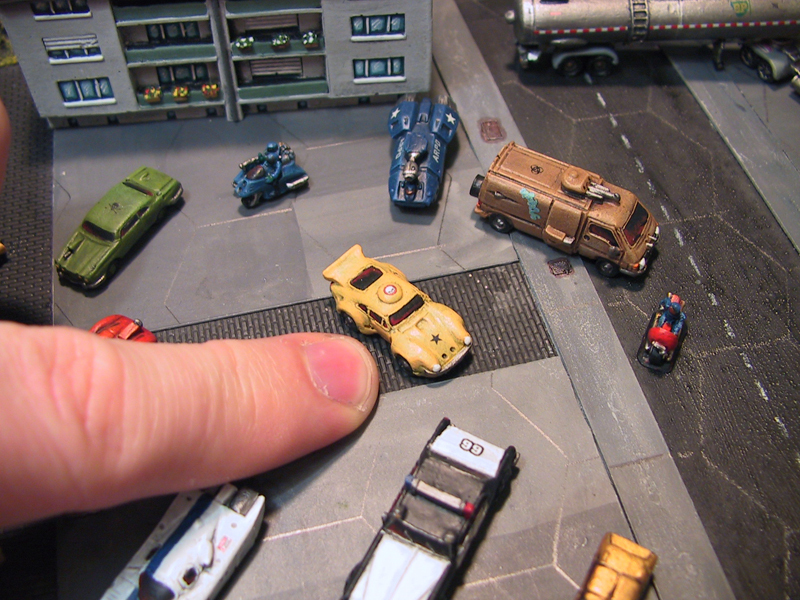 The scenario was very simple to provide an easy intro to the game. 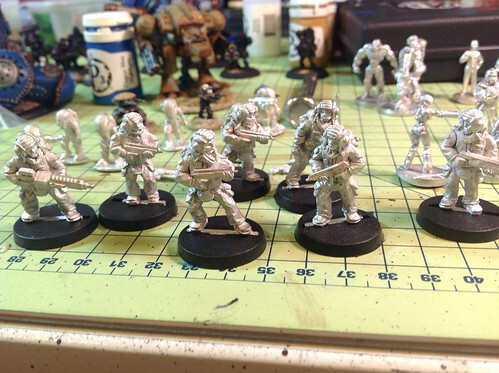 I had some forces from the Gruntz "Heliopause" setting called "The East Hyadym Trade Company". 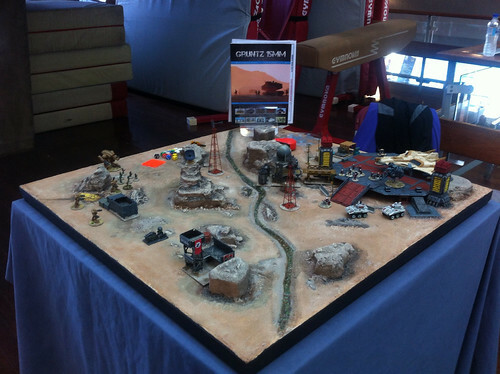 The EHTC were represented with NAC models from GZG and were painted in a colonial red and white scheme. 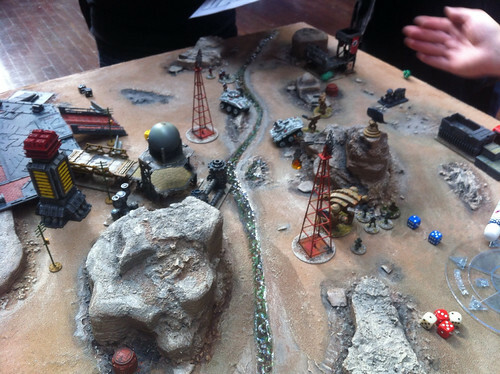 The EHTC were defending a frontier planet outpost and launch pad. The alien enemies were Protolene models from Critical Mass Games and they had the slight edge on the defenders with a large Marok walker with dual plasma heavy arm weapons. The defending EHTC had two APC support vehicles which were GZG hi-mobility models. One was fitted with an anti-infantry automatic weapon and the second had a single plasma cannon. 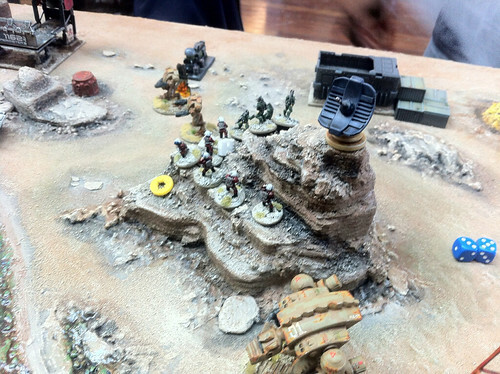 At the start of the game one of the APC's had a squad of EHTC troops already embarked and the second had the Specialist heavy weapons team loaded and ready to be driven to an ideal vantage point to provide covering fire. 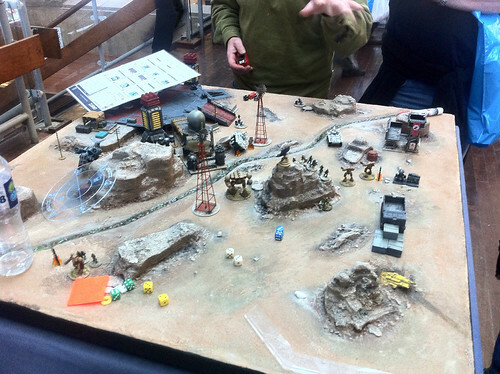 During the third game the defending EHTC player Jonathan, made a great move with the heavy weapons team by driving up the ramp on the launch pad and letting them disembark into a good defending location on the edge of the platform. The games played well and I was really pleased to meet many of the game followers who popped by to say hello. Thanks also to Ben for helping me out on the day. Here are a few snaps with notes. Edit: Thanks for the comments on the miniature names. I got my manga mixed up and need to watch Bubblegum crisis, so I can recognise the models. 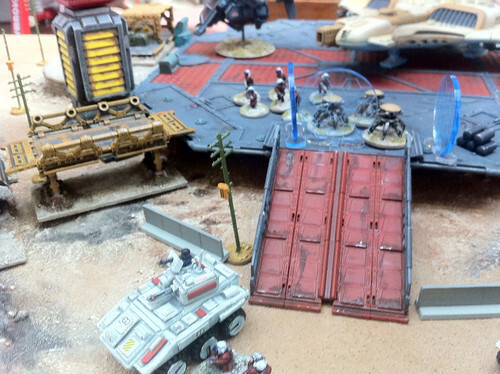 Spider Droids from GZG with shield up face some Protolene walkers. All three spider droids focused laser fire on a single walker which was smoked. The remaining two turned tail and ran to follow the main force on their following activation. The starting location on the third game. Crowds begin to gather on the balcony at the sports centre venue. Interesting rock top skirmish in this first game. The last few moments for the East Hyadum Trade forces. Both vehicles are smoked. Some game chat and pre-measuring. GZG Bubblegum Crisis robots. Amazing stance and details. 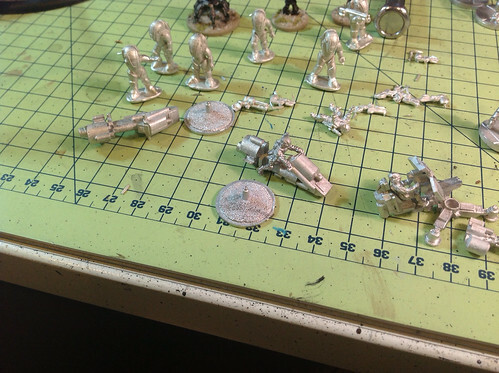 New GZG skimmer bikes and Brigade Models Power Armour. The Brigade power armour has the look of a MAK style egg suit. 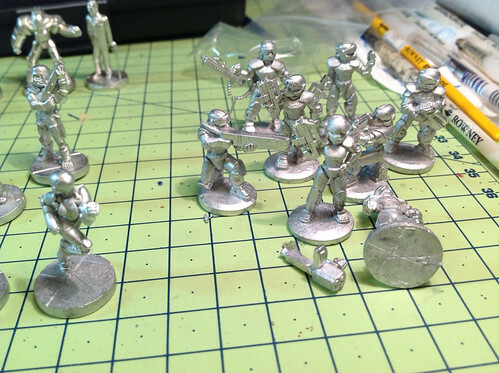 4A miniatures hale and pace 28mm models. 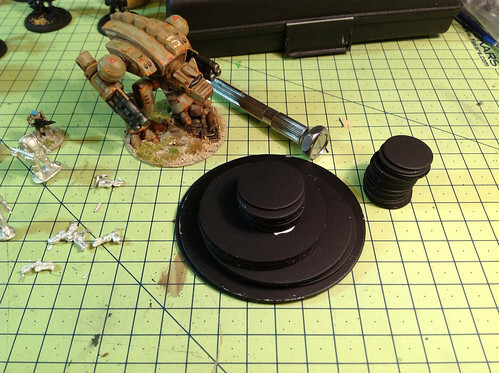 Magnetic bases uk. 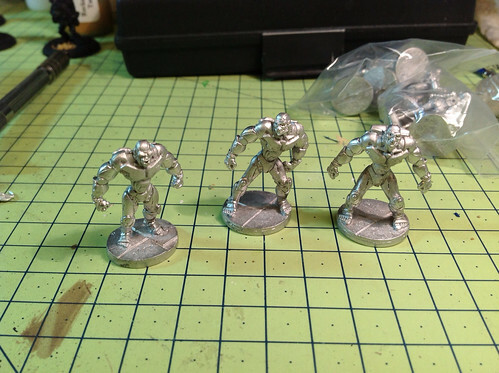 Handy steel bases. Great looking game, looks like the show went really well! 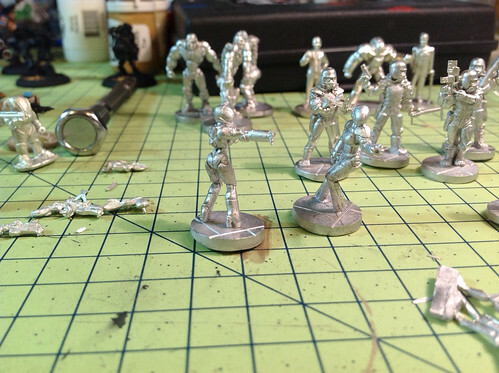 Those 25mm GZG minis are a lot nicer than I thought, especially the Anime ones. I think they are Bubblegum Crisis though? Game looked like it went really well. Was hoping to get a game, oh well, next time. Thanks for the prize, even if I didn't get to play. 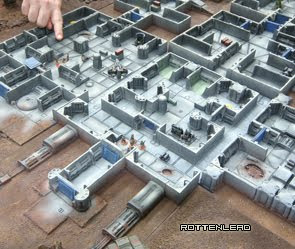 http://store.gcmshop.com/ Game craft miniatures in the US. 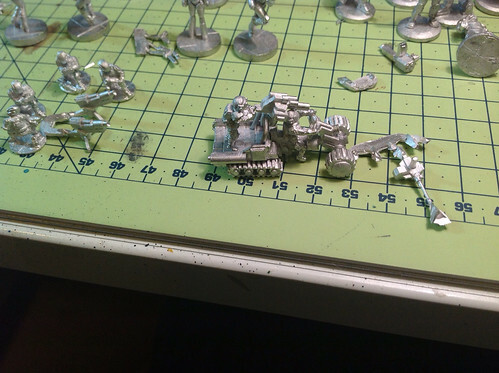 Now If I can just find a use for a 15mm Arnhem bridge. http://www.amera.co.uk/index.php vacuum formed plastic mouldings. They need a little work to bring them up. 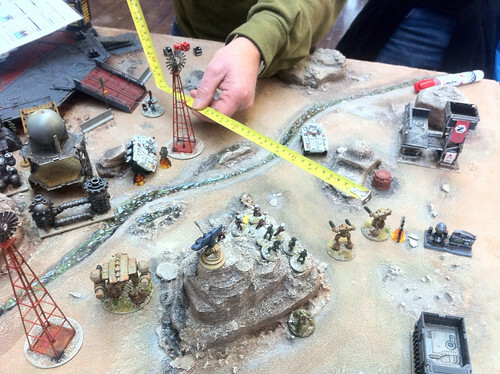 Things like craters and hills are a lot cheaper than GW though. PS. the anime figures are all from Bubblegum crisis. 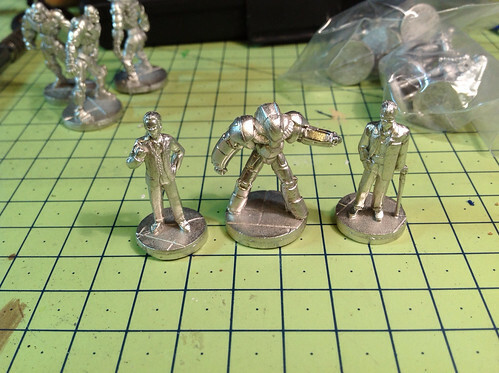 The robots are the Knight Sabre, Mecha is Quincy, Mason, GENOM battlesuit and the police are AD police. 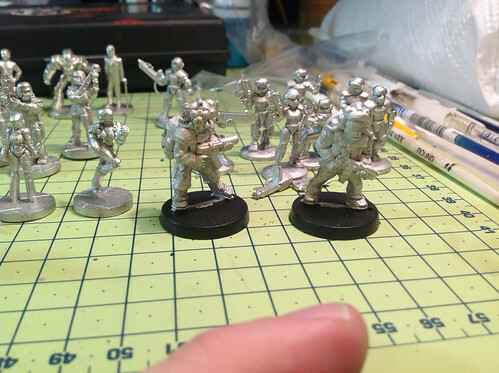 @SpaceJacker: Nearly all of the 25mm (true 25mm) are stunning. The majority sculpted by Kev from Hasslefree miniatures. 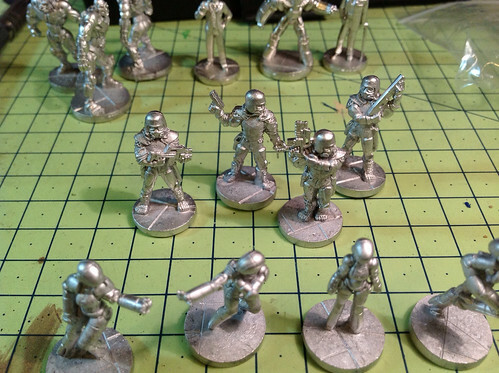 If you want a sci-fi game with models that suit 25 to 28mm scale, you could build a great collection by mixing the GZG ranges with Hasslefree sic-fi. The benefit of being a regular wargames show visitor is that you get to see some of these models in the flesh which helps with the discovery of some the more obscure models on the market. @Woolf: Sorry about the games, everytime you popped away I had a couple of people roll up and start a game. I did not want to schedule the games so ended up going with the flow. I could have fired up a fourth game but I was running out of steam due to a cold. 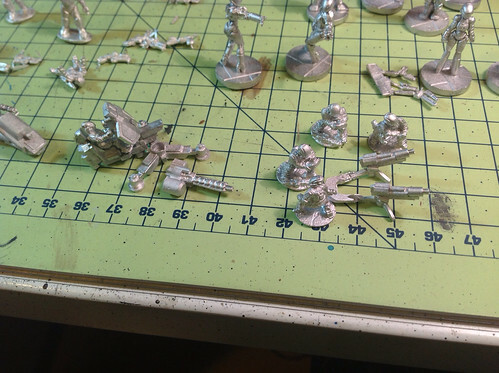 Thanks for the pointers on the battle suits and models, I innocently thought they were all appleseed or appleseed II. I need to watch Bubblegum crisis, I have never seen it and the models look great. If you can, get the original series of BGC. BGC 2040 was nowhere near as good. GZG Bubblegum Crisis robots, should be GZG Bubblegum Crisis Knight Sabre.